As a marketer, when was the last time you really sat down with your sales team and worked through a solid plan to increase lead quality, opportunities and closed deals - TOGETHER? No lip service here. I'm talking the real deal - a concerted effort to think, act and feel sales challenges and get innovative. Bottom line: In these competitive B2B and B2C markets, the marketing and sales teams who can work together successfully will build stronger, better and faster results for their companies. And campaign automation can help achieve this. Mathew Sweezey, Marketing Evangelist, Pardot & Author, "Marketing Automation for Dummies"
Engagement with prospects is always a challenge - in both marketing or sales. It would be great to be able to send a quick email to each of our leads on an individual basis - but is this always a realistic option? Lead nurturing helps address this engagement challenge and helps deliver the right information to the right leads at the right time. Join Mathew Sweezey, author of "Marketing Automation for Dummies," as he addresses the challenges of lead engagement for both marketing and sales teams and gives us valuable information on how lead nurturing can help solve this problem. Is it possible for marketing and sales to truly align? Sangram Vajre explores the differences between marketing and sales departments and what it takes to finally bring them together. Explore how marketing automation may be the key to creating a healthy environment for success. Demand gen can be a tricky business. Lots of moving pieces, lots of time and resources. So, how do you make all of this time and effort pay off for your team and company? A solid, powerful demand gen strategy helps - the power is definitely in the play! Join Adam Blitzer (VP and GM of Pardot, a salesforce.com company), one of marketing automation's leading demand gen experts, in this educational (and even entertaining) webinar. He will explore the world of demand gen and provide insight into power plays that will help bring focus to and strengthen campaign efforts. Want to know the secret to ending the age-old battle between Marketing and Sales? A clear set of metrics that make both teams look like superstars. With the right metrics in place, you can shorten your sales cycle and improve marketing ROI. 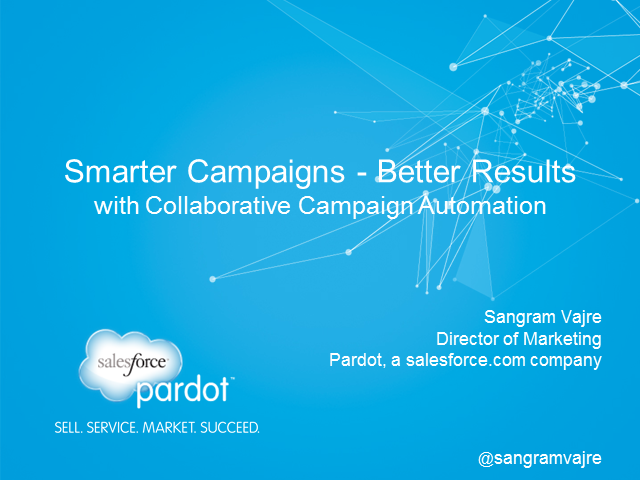 Join Derek Grant, Senior VP of Marketing Automation at Pardot, as he takes you through actionable and easy-to-implement tips on measuring marketing and sales success using Salesforce and marketing automation. Along the way, you’ll learn more about current marketing analytics and how you can leverage those to improve your marketing and sales groups. Completing and deploying campaigns, modifying content, updating social media profiles and more – marketers’ worlds are beyond busy these days! It’s enough to make any normally sane marketer pull a Jekyll and Hyde every once in a while. Enter into the marketing world a new, revolutionary approach: Agile Marketing. Oh, yes. In this world, creativity and analytics have their place and balance. Trial and error is part of the process – and the process is agile. Mathew Sweezey, Sr. Sales Manager at Pardot, explores the new world of Agile Marketing in-depth. Join us to find out how you can apply Agile Marketing to improve your marketing processes…and save your sanity! Mathew is a leading expert in marketing automation, specifically lead flow analysis and nurturing execution. His primary focus is in advanced lead nurturing workflows. He has worked with numerous lead technology companies, helping them create and execute their lead flow and nurturing processes. Smarter Marketing. Better Results. Power your marketing success. Pardot offers a software-as-a-service marketing automation application that allows marketing and sales departments to create, deploy, and manage online marketing campaigns that increase revenue and maximize efficiency.